The German Black Forest is very well known for the beautiful cuckoo clocks that are produced there. Although it is not known precisely when the very first Black Forest clock was created, historians believe that production of these world renowned clocks began as early as the 1600s. The Black Forest clocks began in this time, although the very popular Black Forest cuckoo clocks came later. During the 18th century, the clock industry was becoming a very lucrative profession for inhabitants of the Black Forest. In the southern region, in Furtwangen, the German clock museum is now found. During the earlier years, the inhabitants of the Black Forest were highly skilled in woodworking. Using these skills, they were able to put together a very lucrative source of income, enlisting the help of clerical workers to ensure that the clocks that they created ran smoothly. The earlier clock versions had 12 hour movements and were made almost entirely of wood, including the moving parts. With the increasing popularity of clocks from this area, more clockmakers began replacing some of the wooden movement parts with metal and brass, which greatly increased the durability and the popularity of Black Forest clocks. During the 18th and 19th centuries new tools and crafts were discovered that cut the production time of each clock drastically. By implementing newer and more effective methods, clockmakers were able to create more clocks at a more productive rate than ever before. The number of clocks by just one worker was increased by six times over the span of 100 years. By this time the most popular German Black Forest clock was the shield clock. The cuckoo clock had still not reached its full popularity. About half of the production of all clocks in the Black Forest during the 18th and 19th centuries was the beautiful and elegant shield clocks. During the first 40 years of the 1800s, more than 600 clocks per year were produced from Black Forest clockmakers. The customer base for these clocks had now reached a worldwide base. During that time having a worldwide customer base was quite an outstanding accomplishment; however logistical problems would soon slow down the production of clocks. Clockmakers were facing challenges during that time that were proving to be too much for a single woodworker to overcome. They were working very long hours to ensure that all their customers received their orders and there did not seem to be enough hours in the day to accomplish all that they needed to do. They soon found that by founding companionships with wholesale companies, they could overcome the long hours and needed time, and still ensure that their customers were provided with the highest quality Black Forest creations. During 1870, the production of clocks from the Black Forest reached record proportions. During that year there were more than one million clocks produced. In 1905 the number hit almost six million. This number accounted for half of all large clocks in the world that were produced being done so in the Black Forest. Now when people think of German clocks, they automatically imagine a Black Forest Clock. Many believe that Black Forest clocks instantly means cuckoo clocks, although there are several other clocks that come from the area. 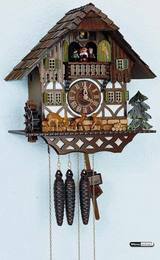 Black Forest cuckoo clocks are definitely among the most popular of all clocks. For centuries, these elegant and sometimes whimsical cuckoo clocks have been one of the most popularly exported productions in Germany. The first cuckoo clock is believed to have been created in Schonwald around 1740. Although these early clocks did not look or function like the cuckoo clocks of today, they were hand carved and had the cuckoo technology integrated in them. The first cuckoo clock that was created to resemble those that we see today was designed in 1850 and named the Bahnhausleuhr. It was designed to resemble a railway house and was the direct result of a contest which was initiated by the world famous Clockmaker School in Furtwangen. The school saw the need for a new Black Forest clock creation and thus began the highly popular act of creating and collecting these beautiful German cuckoo clocks. During the 1860s, clockmakers began creating weights that resembled fir cones and started implementing hand carved, elegant designs into their clock creations. The cuckoo clock soon became the landmark of the Black Forest and an excellent representation of German craftsmanship. Over the years several manufacturers have joined in the cuckoo clock revolution. Of these, Anton Schneider, Rombach & Haas, Hones, Hubert Herr and Hekas have contributed significantly to the tradition and popularity of German cuckoo clocks. While the cuckoo clock remains the most sought after creation from the Black Forest, there are other clocks that clockmakers in this area take pride in designing. The Wooden Wheel Clock, for example, is a fine representation of craftsmanship and beauty, as is the Shield clock, the Jockele Clock and the smallest of the Black Forest clocks, the Sorg clock which was created around the early 1800s. The Black Forest has been very important in the production and creation of clocks of all types for many centuries. The German Clock Museum, which is located in Furtwangen, Germany, is an excellent place to view the many clocks made in this area over history. It is the largest museums dedicated to clocks and has on hand approximately 8000 Black Forest creations. Along with the many historical cuckoo clocks, there are several other versions of ancient German clocks which provide a great look into the traditional methods of creating these beautifully designed timepieces.